The World God Only Knows (神のみぞ知るセカイ?, Kami nomi zo Shiru Sekai), abbreviated as Kaminomi (神のみ? ), is a manga series written and illustrated by Tamiki Wakaki. The manga has been serialized in the Weekly Shōnen Sunday magazine by Shogakukan since April 9, 2008, with individual chapters collected in eleven tankōbon volumes as of December 2010. The prototype version of the story was first featured as a one-shot on Weekly Shōnen Sunday on its 2007 Issue 32 release, and was titled "Koishite!? Kami-sama!!" (恋して!? 神様?). The 2010 Issue #19 of Weekly Shōnen Sunday announced an anime adaptation had been green-lit, which premiered on October 6, 2010. 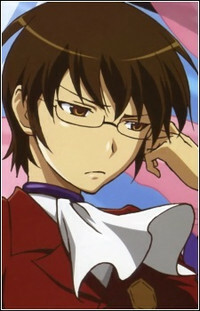 Keima Katsuragi, a second-year high school student, is an avid bishōjo game player. He is known on the Internet as "The God of Conquests (落とし神, Otoshi-gami?)" for his legendary skills to be able to "conquer" any 2D girl in games. However, in his actual school life, Keima is known as otamegane (オタメガネ), a derogatory portmanteau of the two words otaku (オタク) and megane (メガネ-"glasses"), and is considered nothing but an intelligent yet gloomy geek with glasses. At the start of the series, Keima receives an e-mail offering him a contract to "conquer" girls. When he accepts it, thinking it is an invitation to a game, a demon from Hell named Elsie appears. She asks for his cooperation to help her in catching runaway spirits. These spirits hide themselves inside the hearts of girls, and Elsie suggests that the only method to force the spirits out is by "conquering" the girls hearts, making them fall in love with him and filling up the gaps which the runaway spirits hide in. Interested only in 2D girls, however, Keima is appalled by the idea, and refuses the assignment as he has no romantic real life experiences whatsoever. Nevertheless, with the contract already agreed, Keima has no choice but to help Elsie no matter what, as they will be be-headed if they fail. Aside from focusing on Keima and Elsie's adventures on capturing spirits, the series also makes fun and parodying common and popular cliches about dating sims, anime character stereotypes, and pop culture. The World God Only Knows is written and illustrated by Tamiki Wakaki, serialized in the Japanese manga magazine Weekly Shōnen Sunday since April 9, 2008. Wakaki created a prototype version of the story which debuted as a one-shot in Weekly Shōnen Sunday 2007 Issue 32 and was titled, "Koishite!? Kami-sama!!" (恋して!? 神様!!?). Publication is ongoing in Japan by Shogakukan; the first tankōbon was released on July 11, 2008, and as of December 2010, eleven volumes have been released.